To achieve administrative objectives and maintain administrative performance, the Executive Yuan maintains the most important projects under its control every year. All projects are categorized by NDC into one of three levels on the basis of their importance; these levels are "controlled by the Executive Yuan," "controlled by ministries," and "controlled by the responsible agency." According to their nature Executive Yuan controlled projects are monitored by NDC, Ministry of Science and Technology (MOST) and Board of Science and Technology,The Executive Yuan (BOST). NDC is in charge of social development projects and public construction projects. MOST and BOST are in charge of science and technology projects. The controlling agencies monitor the implementation process and employs control and evaluation systems to insure that the project can reach its administrative objectives. Since 2001, projects at all levels have been monitored. 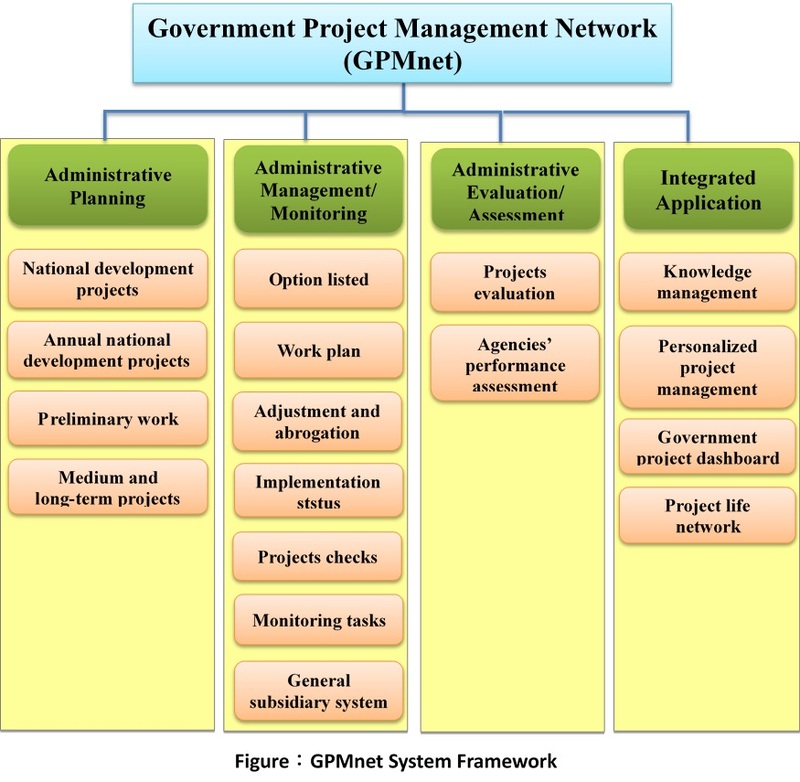 Every government agency is currently implementing versatile project control over the Government Project Management Network (GPMnet) system (see the system framework in Figure), which is accessed through a unitary internet portal, to execute its control and evaluation tasks. Prior to being listed as generally or specially managed projects, the projects will be incorporated into operation plans drafted by the responsible agencies. Information concerning implementation status will be uploaded and updated monthly to allow control of the most recent progress. In addition, NDC submits the project controlled by the Executive Yuan implementation report to the Premier quarterly, and distributes the approved one to all relevant agencies lately. In accordance with the principle of management by exception, in the case of items that are important or seriously behind the schedule, the controlling agencies will conduct field inspection or visits, and guide or coordinate the resolution of problems and difficulties. At the end of the year, all the projects performance should be evaluated. Evaluation emphasis is on the degree of objective obtainment and actual targets of indicators. The performances are also evaluated by the three levels. The projects controlled by the Executive Yuan are evaluated by NDC, MOST and BOST, of which the performance report forwarded to the Prime Minister for final approval.